Circulon gourmet cookware is a key ingredient to healthy living. Its TOTAL® nonstick system eliminates the need for butter and oil from your everyday cooking. You can cook great, and look great, every day. Circulon has always been a leader in offering healthy cooking solutions. With its TOTAL® Hi-Low Nonstick products, there is no need to use oil or butter when cooking healthy meals. Circulon ranges many different cookware products, in a variety of materials to suit your needs in the kitchen. 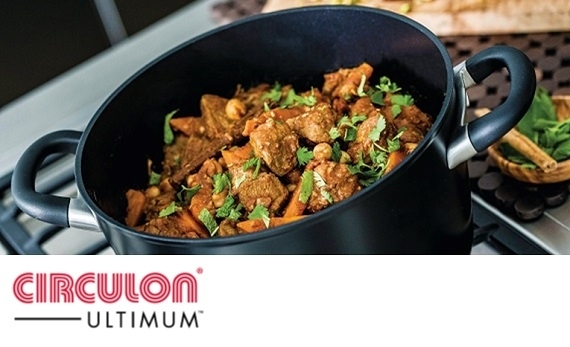 From hard anodised to the highest quality aluminium, and whether you'll use your pans for making meals for yourself, entertaining friends or cooking for your family, you'll be sure to appreciate the outstanding durability and performance of Circulon. Built for a lifetime of hassle-free cooking, our elegantly shaped Circulon Symmetry pieces combine an ultra-tough hard-anodised construction with the exceptional performance of our unique non-stick system of circles. We chose some of our best-selling pieces to bring you a cookware set that will provide the perfect tool for every cooking occasion. Coated with our superior PFOA-free DuPont™ Autograph®non-stick, our pans are metal utensil safe and resist scratching, staining and chipping to provide extraordinary food release without the need for added oils or fat. 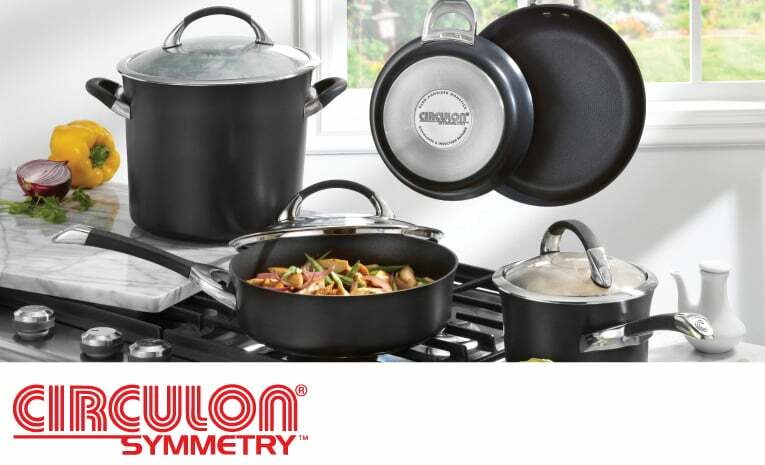 For reliable cookware that delivers perfect results, choose Circulon Symmetry. 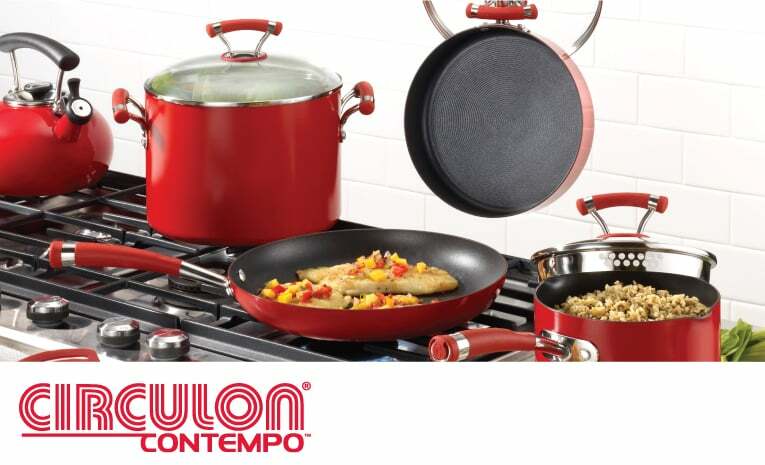 With its bright red exterior and modern profile, Circulon Contempo will instantly spice up the look of any kitchen with a bold burst of colour. Heavy-gauge construction offers fast, even heating for great cooking results every time. The comfortable silicone and stainless steel handles are double riveted for extra strength and is oven safe to 200°C. The shatter-resistant tempered glass lid allows for monitoring the cooking process without losing moisture or flavour. Featuring Circulon's unique circles to reduce surface abrasion, coupled with our TOTAL® non-stick, these pans deliver extraordinary food release and exceptional durability – and are metal utensil safe. The magnetic stainless steel base is designed for use on all cook tops, including induction. The collection is dishwasher-safe, making clean-up quick and easy. Passionate cooks will love the Ultimum High Density Forged Aluminium with High Heat Resistant Fittings range. Every piece uses our unique Ultra TOTAL® non-stick system and our new profile, hi-low circular grooves. With a forged edge to edge induction compatible base, it’s suitable for every type of hob. Our advanced, high heat resistant phenolic handles make a comfortable alternative to stainless steel and can withstand heat up to an impressive gas mark 6, making them ideal for hob to oven cooking. For high performance that delivers everything you need, try Circulon Ultimum.